Tough damage resistant plastic construction keeps you feeling secure during loading and unloading, while changing a tire or when doing general maintenance to your vehicle. These recycled plastic wheel chocks are durable yet light enough to take along when you travel. Made with 100% recycled plastic, the wheel chocks are guaranteed not to crumble, deteriorate or rot. They are also resistant to the oils and chemicals found in most work areas. 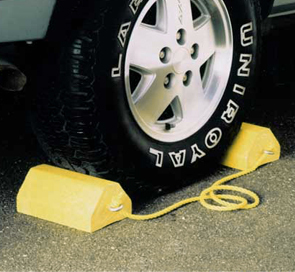 These wheel chocks are connected together with a durable nylon rope. This allows them to be easily removed from under the vehicle. The bright safety yellow color makes the wheel chocks highly visible and with the molded-in color feature they will never need painting.